Halo 3 holds quite an impressive record. It's had the highest opening day gross of ANY form of entertainment EVER. The game took in 170 million dollars on it's opening day. Do the beautiful people need any more proof that us geeks have taken over the world? I don't play Halo, but I get the general premise. You'd have to be pretty out of touch not too, let's face it. The good guys are Master Chief and the other Spartans, cyborg supersoldiers. 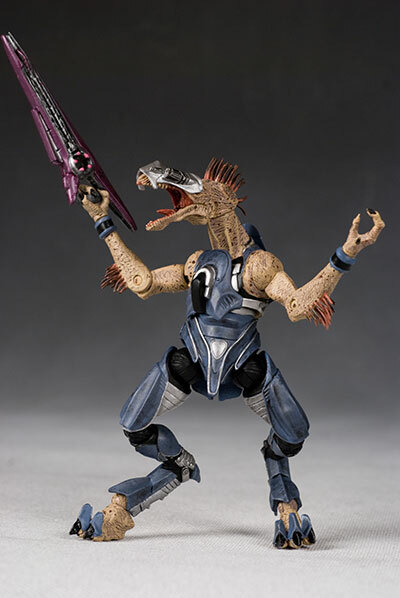 They battle the Covenant, a diverse race of aliens driven by religious fervor to wipe out humanity. 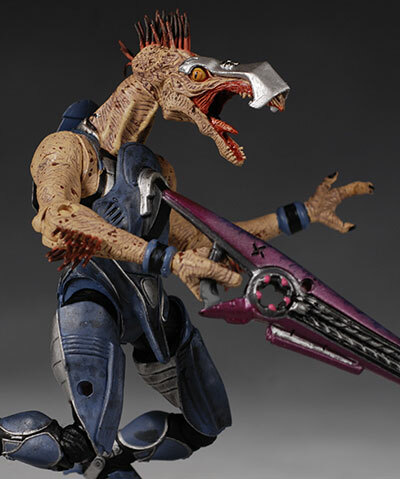 Mcfarlane Toys picked up the Halo 3 license to produce action figures, and have just released their first wave. 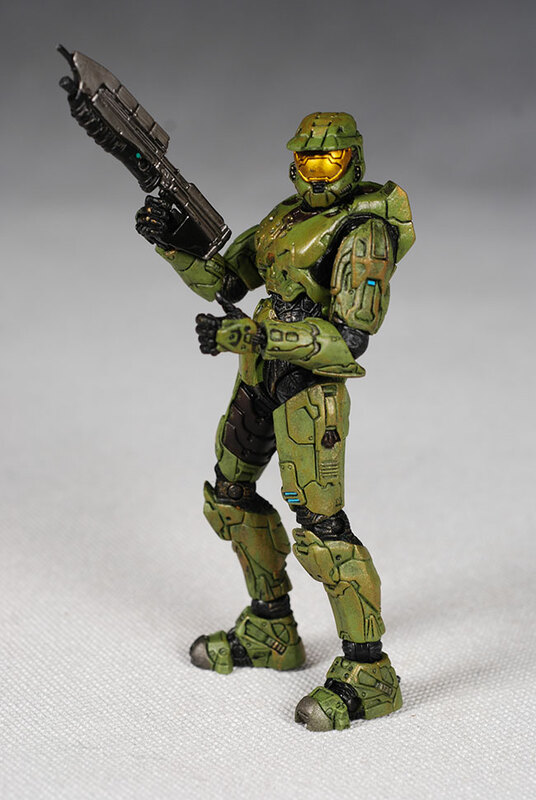 There are a TON of figures to pick up, and I'm reviewing four here tonight (Master Chief, Grunt, Jackal Sniper and the Mark VI Spartan) and I'm reviewing three more over at Quick Stop (EVA Spartan, Brute Chieftain and Cortana). 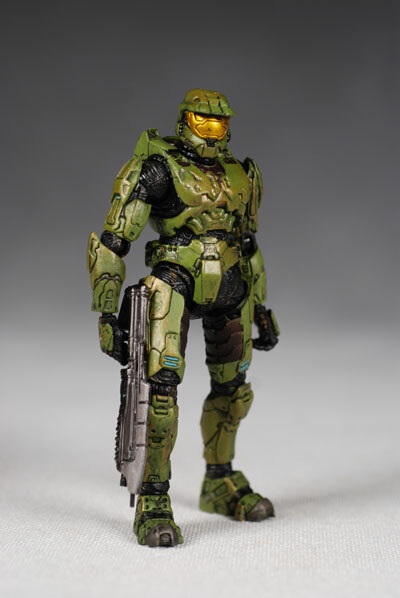 There are several exclusives, including a blue Mark VI exclusive to Wal-mart, a white Mark VI Previews (specialty store) exclusive, a blue CQB exclusive to Wal-mart, a steel CQB exclusive to GameStop, and an active camo EVA exclusive through Mcfarlane's webstore. I believe there's also a green version of the Grunt, but I haven't seen one yet. That's a ton of figures! The 'official' release for these figures was today, March 4th, but retailers started putting them out early in some areas. There are a number of big retailers including Toys R Us, Wal-mart and GameStop, and you can expect to pay around $10 - $14 each. I have some online suggestions at the end of the review as well. And before I get a bizzillion emails, I know that the Jackal's gun is backwards. Hey, it fit better that way! The packaging has a couple negatives holding it back from a higher score, but it also has one very big positive. First, the negatives. These are clearly too large for 90% of the figures they contain. You really don't need to be buying quite this much air with your action figures. Then there's the twisties. Even with a solid clamshell and a tight tray, they felt the need to hold them in with 4, 5 or more twist ties. You're killing me here. On the plus side though, these all have character specific information included on the inserts. Rather than going with a generic version, they've added details and background information on the specific character, which is a big plus in my book. I wish this would become the norm in action figure packaging. The entire series has some excellent sculpting, with plenty of small detail work, nice texturing on the armor and skin, and excellent proportions. The number one issue that is going to be discussed around the sculpting of these figures is the scale. These figures are in a 5" scale, with MC and the Mark VI standing right about that height. This may be a deal breaker for some folks, particularly those looking to fit these figures in with other lines. They'll go with those movie Spider-man, Batman or Superman figures...but I doubt that's going to be much of a consolation. EDIT - a reader let me know that the Spartans are 7 feet tall, not 6. That means that at 5" tall, they are actually in a scale that puts a normal man at about 4.25" tall. In other words, these figures are technically too short to be in scale with other figures in a regular 5" scale, and too tall to be in scale with figures in the regular 3 3/4" scale like Joes or Star Wars. In other other words, they're in a scale all their own. I've included a photo of MC with a Stormtrooper for further reference. 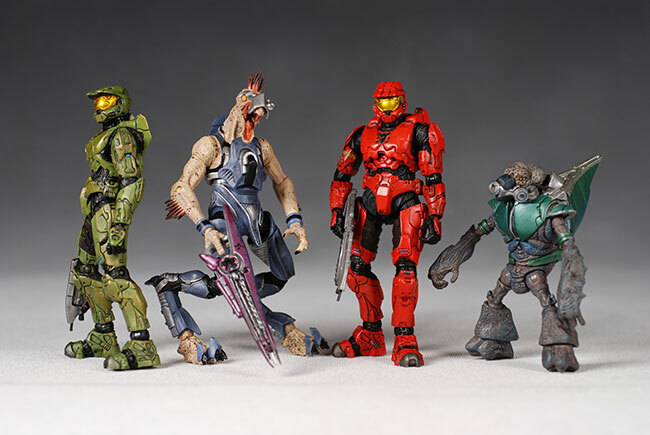 However, with such a large number of figures released in the first series, with another big chunk planned for series 2 in June, I think most Halo fans will overlook the fact that these are on their own in the display. The fact that they look outstanding helps soften up the scale issue even more. Each of the Spartans have slight sculpt differences to go along with the paint changes. The EVA is different than the Mark VI is different from the CQB. We used to call this 're-decos', since there's more than just a repaint. Of these four, I have to admit to liking the Jackal Sniper the best. There's a cool texture difference between his armor and skin, the spiky hair looks great, and even the itty bitty teeth look perfect. He stands about 5" tall as well. The Grunt has some nice texturing, especially around his face and head. The mask is designed to fit tightly, but he looks good with or without it. He's the smallest of the bunch, standing about 4" tall. The sculpt also works great with the articulation, and there's plenty of that. All four of these figures stand great on their own in lots of stances, including the Jackal Sniper. Even though he has those funky bird legs, he still stays upright just fine. Their hands are all sculpted to work with the weapons, and they work quite well for the most part. It will take a little work to get the Grunt's hands to wrap around both accessories, and getting the weapon into the Jackal's right hand took real effort, but once it was there it certainly stayed. Like the sculpt, the paint ops are terrific. Most of the figures have a decent number of operations, and all of them are done cleanly and consistently. 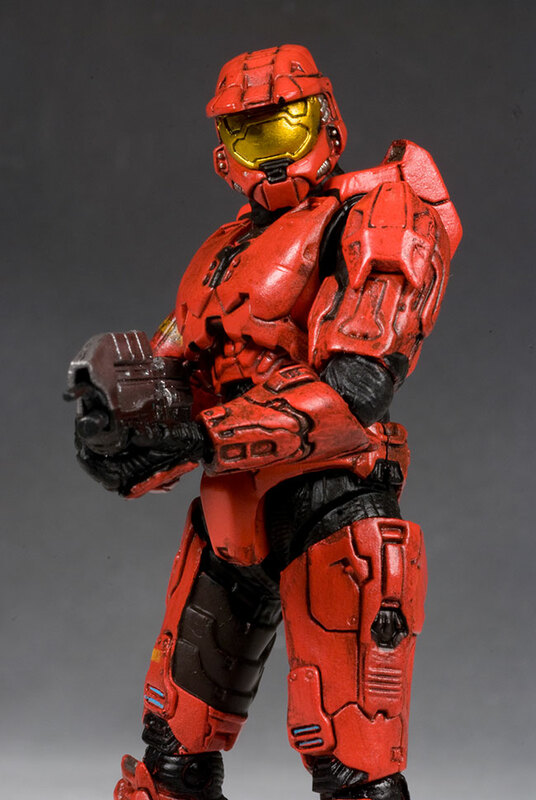 Both Master Chief and the Mark VI Spartan look excellent, but I did have a errant mark on the face plate of my Chief. It detracts from his overall look, and he came right out of the package that way, so he loses a half star. Both of these figures have clean black lines on the armor (which are sculpted lines of course, filled in with black paint), and the slightly glossy finish on the armor contrasts the flat black color of the underlying suit. The Jackal has the coolest looking armor, done in silver and gray. There's an inconsistency to the color, done on purpose to give it a weathered, worn look, and it works quite well. He also has a wash on his skin, bringing out the sculpt details, with excellent paint work on his mouth, teeth, eyes and tongue. The Grunt ends up with the dullest palette, with his colors blending together a bit more than the others. He still sports a nice amount of detail, it's just harder to see because of this blending. Over the last few years, Mcfarlane Toys has truly defined the term Nerd Hummel. They've produced fewer and fewer true action figures, instead producing statically posed plastic statues that have nothing in common with the action figures of yore. This series proves that they are very capable of creating real action figures, with the same level of sculpting and paint and yet tons of excellent articulation. 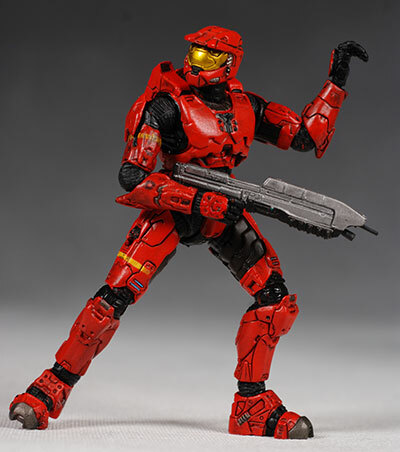 The Spartans have excellent ball jointed necks that give them tons of personality in every pose. They also have true ball jointed shoulders, hips, and ankles. All of these joints are articulated on both sides of the ball, giving them an excellent range of movement. You'll have to work some of the balls free, particularly the ankles, but once you do, you'll be able to do a ton of creative poses. He also has ball joints at the wrists, elbows and knees, but these are jointed on just one side of the ball. Still, these joints work fantastic, much better than we've seen in other lines. Finally, they have a half foot pin joint, and a rocker chest. The articulation is really, really impressive on the Spartans, and the more I played around with them the more I liked them. The Grunt and Jackal aren't *quite* as articulated, but they still have more than enough joints to make even a serious articulation junkie happy. The Jackal has the ball jointed neck as well, but he has cut shoulders. There's a cut bicep though, as well as pin elbows and cut wrists. 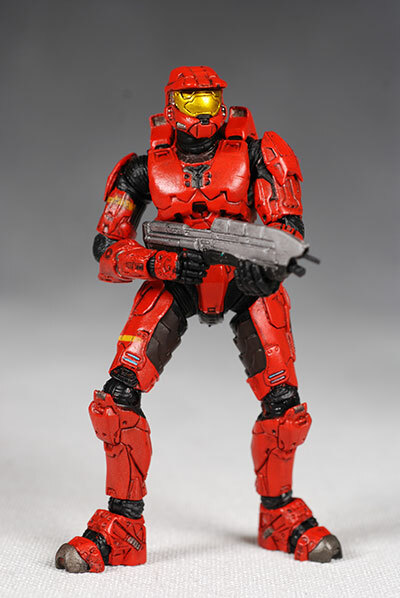 He has the same rocker chest and ball jointed hips, knees and ankles as the Spartans. 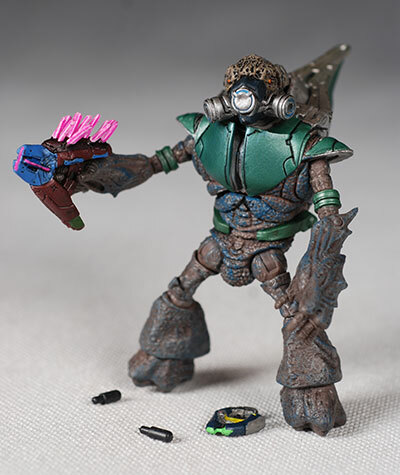 The Grunt is the smallest, and least articulated. He still has an excellent ball jointed neck though, along with ball jointed shoulders, cut bicep, a rocker chest (with limited movement), ball jointed hips, ball jointed knees (jointed on just one side like the others0, and cut ankles. 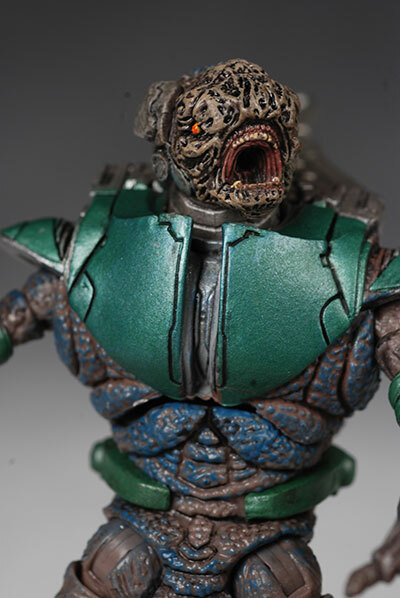 All of this articulation also looks great, and none of it damages or ruins the appearance of the sculpts. The joints are generally tight, and hold poses extremely well. Unfortunately, the figures lack in this category. Considering that the game is all about death, destruction and mayhem brought about with a multitude of weapons, it's a bit disappointing that we didn't get much of that here. 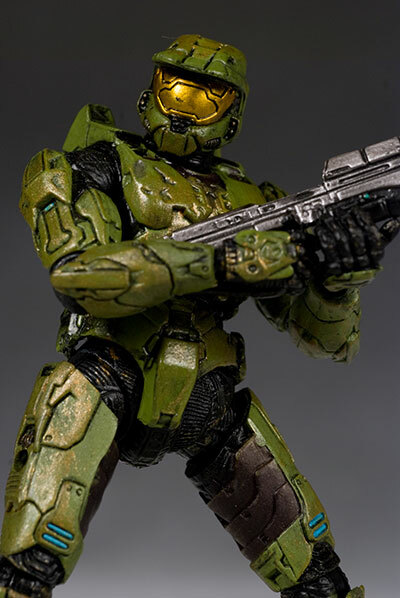 Master Chief has his gun, which is the same one that comes with the Mark VI (and all the Spartans). The Mark VI also has a grenade. 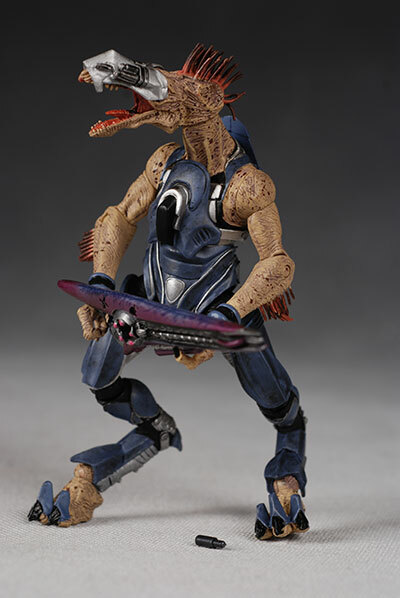 The Jackal has his weapon as well, which has an excellent sculpt and paint job, but is his only accessory. Finally, there's the Grunt, who comes with not one but two weapons, both of which he can hold in his hands (with a little work). He also has the removable mask, which pops on and off smoothly, and his 'backpack' can be removed as well. Now that's more like it! Every one of the figures also comes with one or two small pegs. These can be used to attach the guns (or grenades) to their legs or backs where there are small holes to accommodate them. And thanks to one of my intrepid readers who pointed out that you can also remove the heads, shoulder and chest armor on the Spartans to mix and match! These figures aren't just perfect for teen and adult fans of the game - they are excellent toys as well. 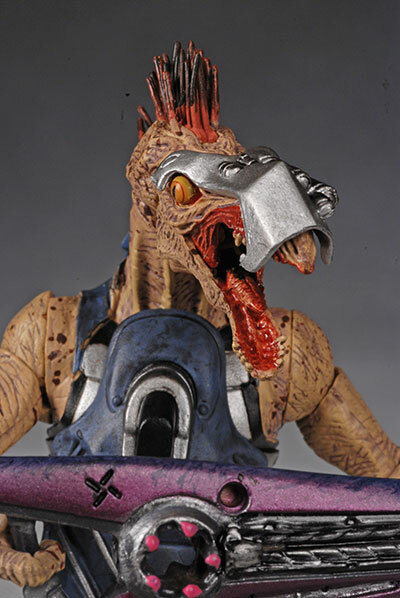 When Mcfarlane Toys started out, the mission was to produce the coolest action figures out there. 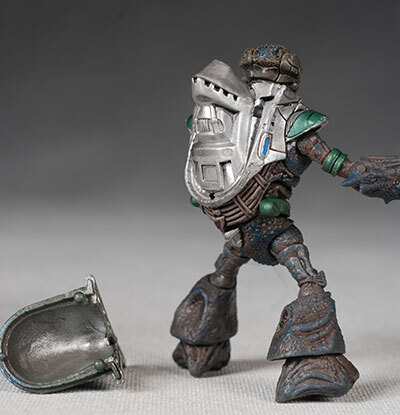 Over time, while the sculpts and paint got better and better, the connection to being action figures got thinner and thinner. They began to produce more and more Nerd Hummels, with little or no articulation, and made fewer and fewer figures that could still be considered 'toys'. This line is a return to the original concept. 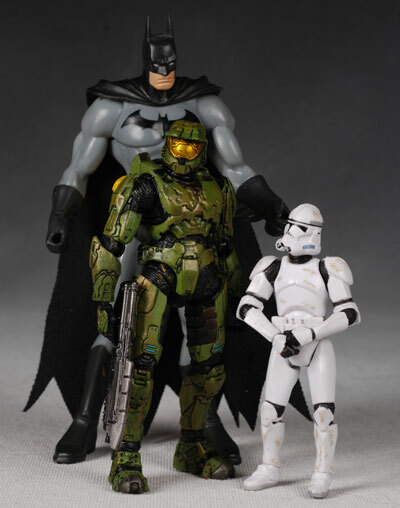 These are action figures, not little plastic statues, and while adult collectors will think they look fantastic, kids could have a TON of fun with them as well. 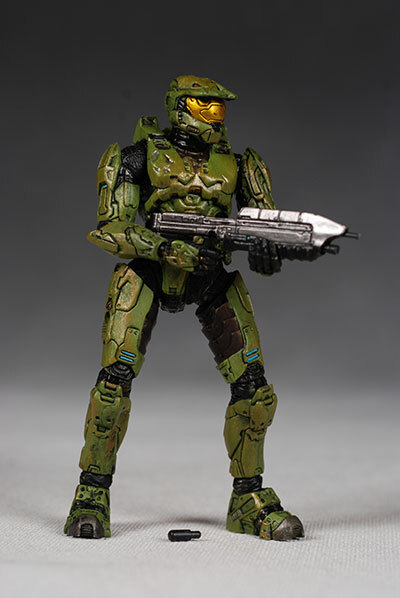 In fact, these are fun for kids who have never played the game, and could actually introduce them to the license before they get to play Master Chief themselves online. As cool as these are, they aren't $13 - $14 cool. Ten bucks? Oh, Hell yes, even at the 5" scale. Some retailers will have them that cheap too, and I'd add another half star easy at ten bucks. Twelve bucks? I'd be tempted to add another half star here too, giving them an average value. But the additional two or three bucks is going to end up costing you an extra $30 or $40 to your tab, depending on how much of the overall series you pick up. Had these been just as good in a 7" scale, or had they been more heavily outfitted, I would have added another half star. The wrist joints can be easy to break, particularly on the Spartans. If yours is painted tight, be sure to use the freezer trick before trying too hard to loosen them up. And since I ended up with a Master Chief that has a really obvious mark on his gold visor, you'll want to watch out for that as well. 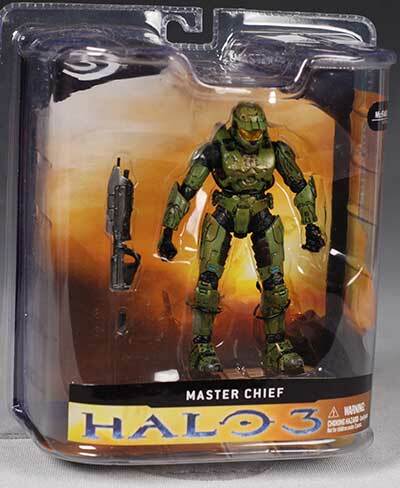 I'm very impressed by this first series of Halo 3 figures, and I think that the fans of the game are going to respond quite well. Even kids that have no idea who these characters are will find them intriguing. We've known that Mcfarlane can produce fantastic action figures when they want to. Unfortunately, they haven't wanted to for quite a few years now, instead focusing on the plastic statue. But this series proves that when they want to, they can produce excellent toys that will make adult collectors AND kids happy. This license lends itself to that of course, but they could have wimped out and just produced 7" statues. Instead, they went for it, and fans of Halo 3 are better off for it. By the way, had my Master Chief not exhibited the quality issue (the obvious mark on the front of his helmet), he would have scored a perfect score as well. Yes, I know that at this price we really should have gotten a few more accessories, but I can't argue with how much fun these are. They have that 'it' factor that gives them a special boost in the Overall category. - Clark Toys has the singles for about $11 - $15 each, depending on the character. - Urban-Collector has a case of 12 for $130. This might be your best bet to get a full set. - CornerStoreComics has them for $13 - $14 each. - Entertainment Earth has them in stock at $14 each. - YouBuyNow has them at $15 each. - or you can search ebay using My Auction Links. - here's their version of the Grunt. - there's also a guest review of the Elite Guard. 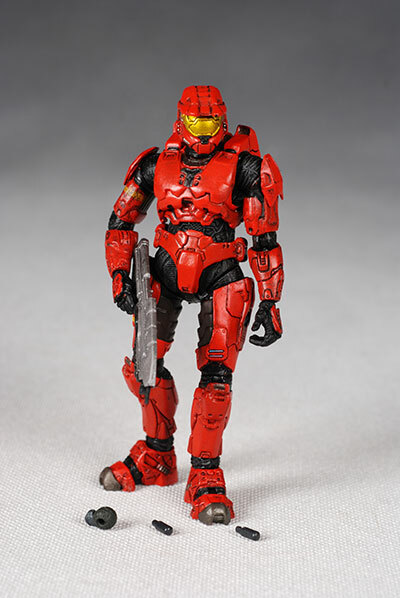 - And you can't forget their version of Master Chief! - I've also reviewed three more of this first series over at Quick Stop Entertainment - Brute Chieftain, Cortana and the EVA Spartan.